Yes, I do try, with little success, to portray my home as minimal, shabby chic, retro and altogether awesome. No, I don’t want you to see what it’s really like – No, Sir! But, in my “call a spade a spade” manner, I decided to show you reality. Oh yes, I’m a bonefide clutter-bug. I hoard things and, to make it “ok”, I put the stuff into piles. When something is in a pile it is no longer rubbish or useless. It’s serving a purpose and has some level of importance, otherwise it wouldn’t be in a pile. My latest pile of stuff is a few stones, a mussell shell, a feather and some autumn leaves gathered on a walk. This pile of stuff will at some point be disposed of, but it will stay around for longer than it should – I promise! I made a pile of stuff a few days before that contains all the little bits and bobs I don’t know what to do with. For instance, some batteries (usuable or not??? good question), a button, a mysterious key never seen by anyone before (possibly a locker key), a few receipts and an elastic band. Ordinarly, this pile of stuff would end up in the Bits and Bobs drawer. However, the Bits and Bobs drawer is full to bursting so the pile is in residence on the coffee table. Its a pile of great concern. None of the items should end up in the bin, some may still be of use. It will vex me for days until I find a place to hide it. Not all piles of stuff are junk mind you. 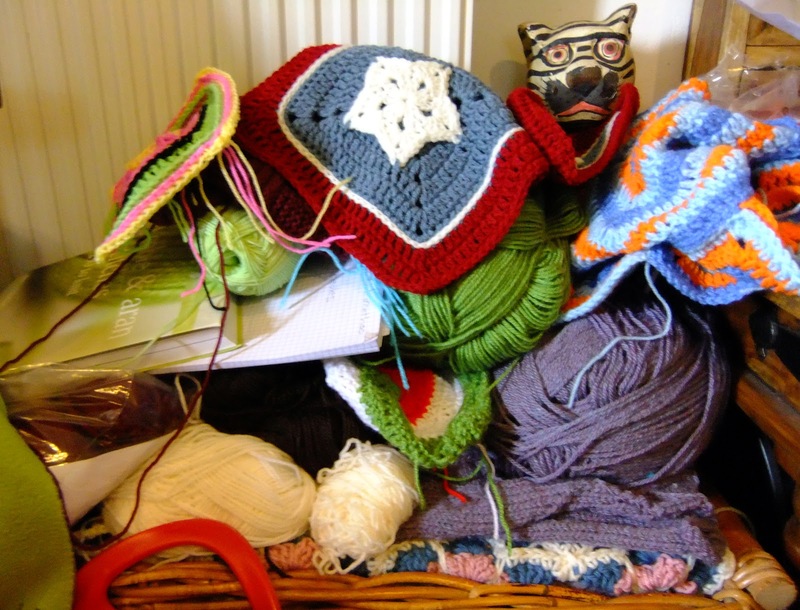 Some piles contain important paperwork, others reading material and some contain wool. I’ve decided, not having the courage to confess all, I will confess just my work area to you. In Blog Land I have seen Rooms of Wonder. Workrooms and studios to die for. Everything all neat and tidy, fresh and bright. All wool and tools immediately to hand. Oh, wonder of wonders! 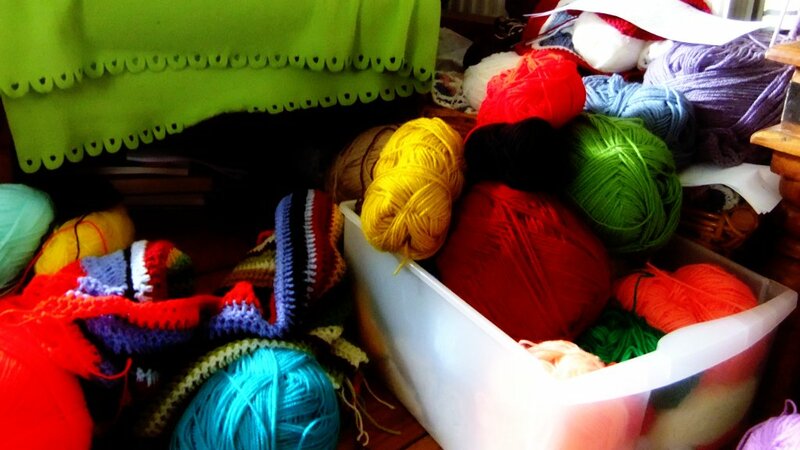 How I dream of one day having the luxury of a spare room dedicated to wool and all things crafty. However, I struggle by in a corner of the living room. My wool is stored neatly in various places around the house but my work station is a bombsite. Yes, it’s a sight isn’t it! I know you would all love to see a beautiful room with wonderful storage solutions and everything all neat and wonderful. But, I thought it of great importance to confess my bombsite. Not all of us have enough space, a spare room, an out-house, garage, attic or converted barn and we struggle through in tiny corners and spots in our homes. 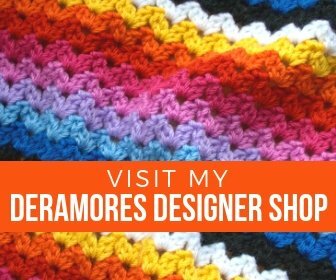 Works of Crochet Wonder can be created anywhere and we don’t need a fancy pants Room of Wonder to do it in. So, banish any feelings of inferiority that have emerged from seeing Rooms of Wonder. All you need is a seat, a cuppa and wool! Despite how things look, everthing is in order. There are piles of stuff you see, each pile containing something of importance 🙂 Bottom left of the photograph is what I should be working on today – Christmas Bunting. As you can see the cat has won The Seat of All Pervading Power. This happens every time I get up. There are 3 cats in Weavers Cottage and all of them think this seat is THE best seat in the house. There is usually a dart for it as soon as I stand up and sometimes a squable and a hiss. Suffice to say, if I had a Room of Wonder, the cats would be banned, banned, banned! In this photograph I can pick out 12 projects. And that’s just what is visible!! This is a pile of stuff to be sure, in it are many important things. These are projects that have been waiting patiently for me to finish them, sudden flashes of design inspiration, and one or two knitting wips. No matter how I try, this pile never shrinks. It’s the pile that gets the least attention. The other piles are temporary and soon become Ta Da’s but this poor pile just sits there awaiting my attention. Now and then I delve in there just to tidy it up and remind myself of what is in there. Which is what I’m going to do next while dreaming of my future Room of Wonder! 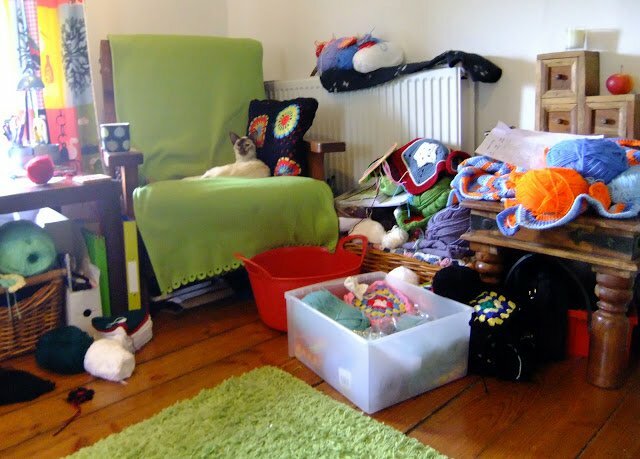 I sometimes wonder if those dream craft rooms we see on the web stay like that for long or if the owner really makes anything in there, otherwise it wouldn't be that tidy, would it? Most of my craft supplies are in plastic units with drawers behing the sofa, this means that everytime I need something from there the sofa has to be moved and then put back again. The crochet projects I'm working on are in plastic bags on the floor, in a corner between the sewing machine and a tool box I "borrowed" from my husband and where I keep more craft supplies! I have a bombsite just like yours in my living room! I think all serious crocheters do. They must. I love your work area, or should I say areas! I'm lucky enough to have a little room to call my own but it doesn't look anything like a room of wonder, more like a room of bung it anywhere! and there are many projects and ideas waiting to reach the surface of various piles. I think this is all perfectly normal and wouldn't want a 'perfect' workspace anyway! My excuse for not showing you all my messy apartment is that I don't have overhead lighting in any room. That's why I'm artfully staging my pictures in a light box :). As for your place, it looks cluttered but tidy, so that's a good thing! I didn't see any giant dustbunnies attacking your yarn. I took you at your word and decided to out my mess.Come over to my blog and take a look LOL!